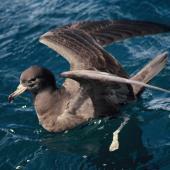 Flesh-footed shearwaters are medium to large-sized dark seabirds with long powerful hooked bills. 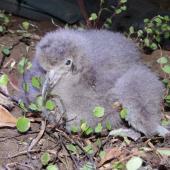 They nest on offshore islands around northern New Zealand and in Cook Strait. 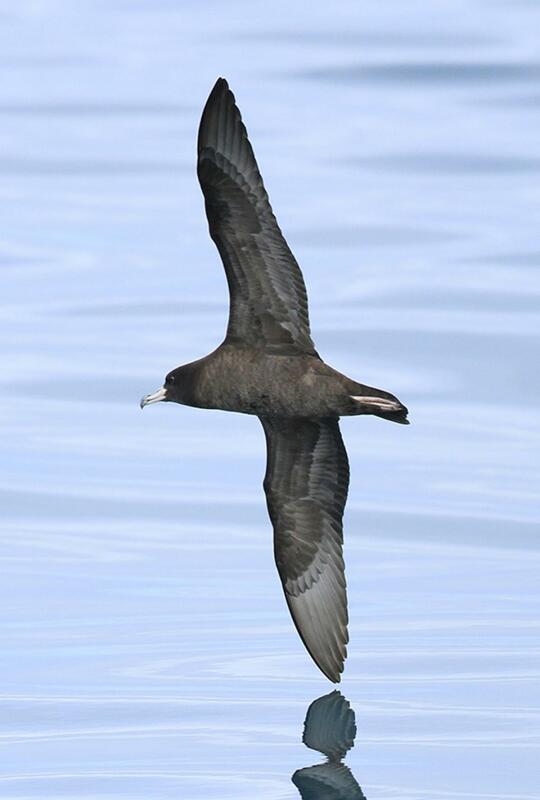 Flesh-footed shearwaters are attracted to boats and are commonly observed over inshore seas, especially in the Hauraki Gulf and Bay of Plenty. They often sit behind recreational fishing boats and dive to retrieve bait and discarded fish scraps. Their persistence in taking bait from fishing lines puts them into conflict with both recreational and commercial fishers, often with fatal consequences. 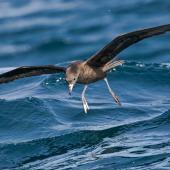 After breeding, the birds migrate to the North Pacific Ocean where they spend the northern summer in the seas off eastern Japan. The return migration is through the central Pacific Ocean. 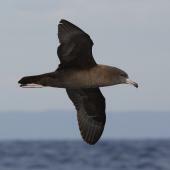 The flesh-footed shearwater is a medium to large-sized dark brown shearwater (tube-nosed seabird) with long relatively broad wings and a long pointed tail in flight. 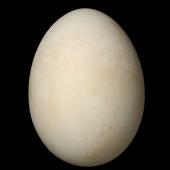 They are uniformly dark plumaged, contrasting with the pink-white bill and white-flesh coloured legs. In the hand, the pale bill (38-45 mm long) has a sharp hook. 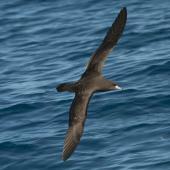 Voice: the calls of flesh-footed shearwaters resemble cats fighting, with loud wailing and moaning. 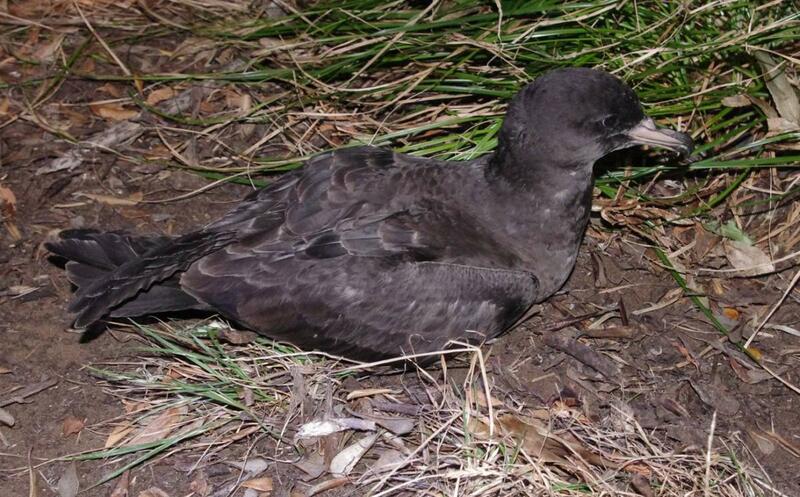 Similar species: dark morph wedge-tailed shearwaters are very similar but have longer tails and all-dark bills. 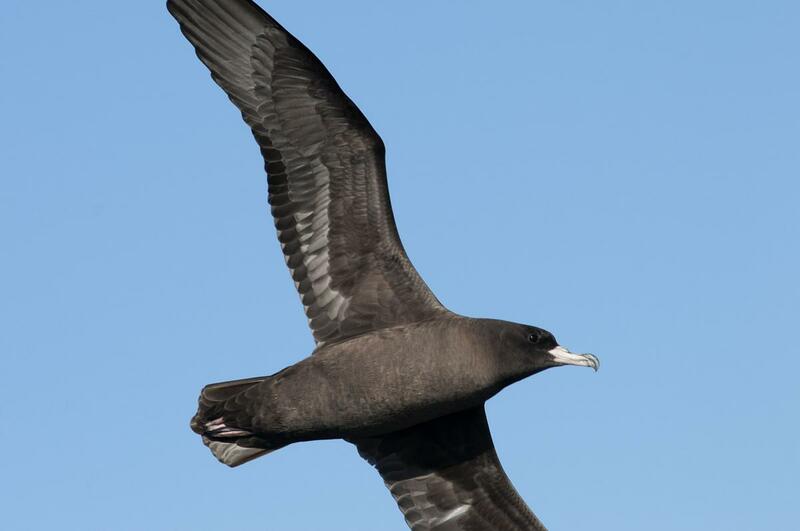 Black petrel (which co-occurs with flesh-footed shearwater in the outer Hauraki Gulf and adjacent deeper water) is larger and heavier-looking, with darker black plumage, a creamy-white (cf. pinkish) bill and black legs. 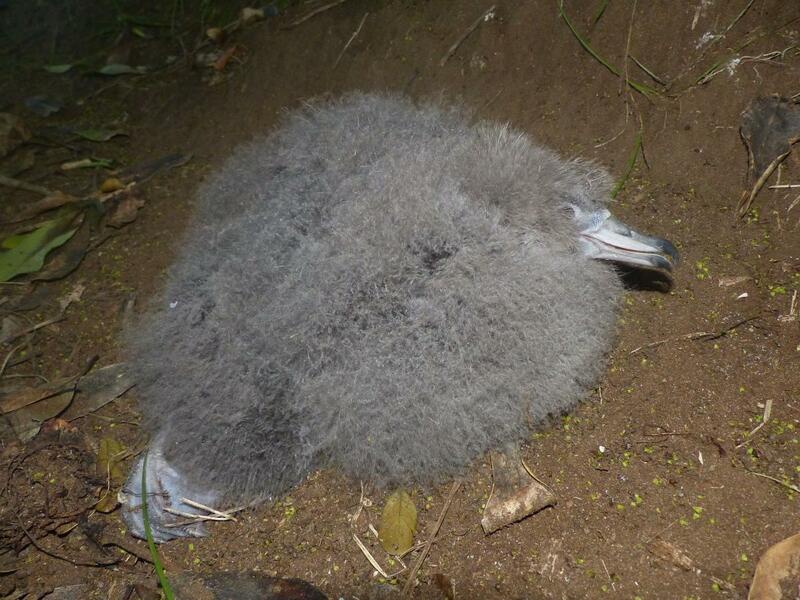 Flesh-footed shearwaters nest on 15 islands around northern New Zealand and in Cook Strait, with the largest colonies on the Chickens and Mercury groups plus Ohinau and Karewa Islands. Elsewhere, there are colonies on Lord Howe Island, islands off Western Australia and on Ile St Paul in Indian Ocean. 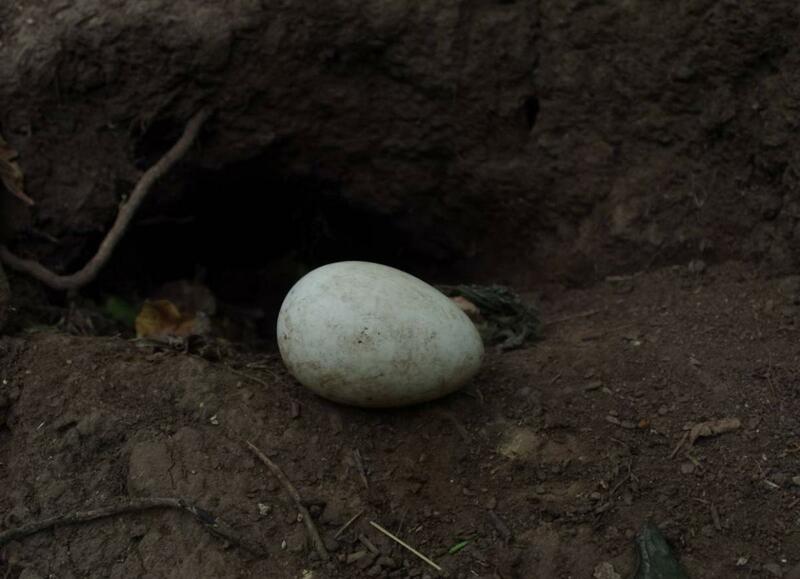 The breeding burrows are normally dug on well drained sites with sandy or clay soils, and under tall forest or low coastal shrubs such as taupata or kanuka. The birds are powerful diggers and dig burrows 1-4 m in length. 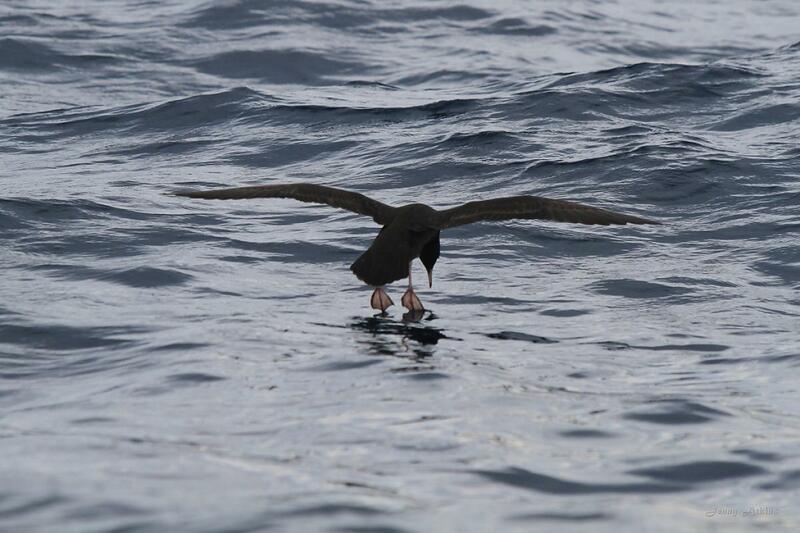 Flesh-footed shearwaters forage over warmer water north of 43°S, either over shallow inshore seas or over deep water beyond the continental shelf. After the breeding season, they migrate north past Fiji and Tonga to complete the annual feather moult in the North Pacific Ocean off Japan. 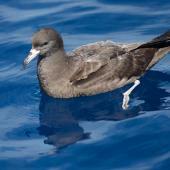 Recent surveys in New Zealand have found far fewer flesh-footed shearwater pairs than expected. A survey of 8 major colonies found 8000 pairs, and a further 3000 pairs are estimated to occur on Middle Island. The total New Zealand population is therefore less than 12,000 pairs. 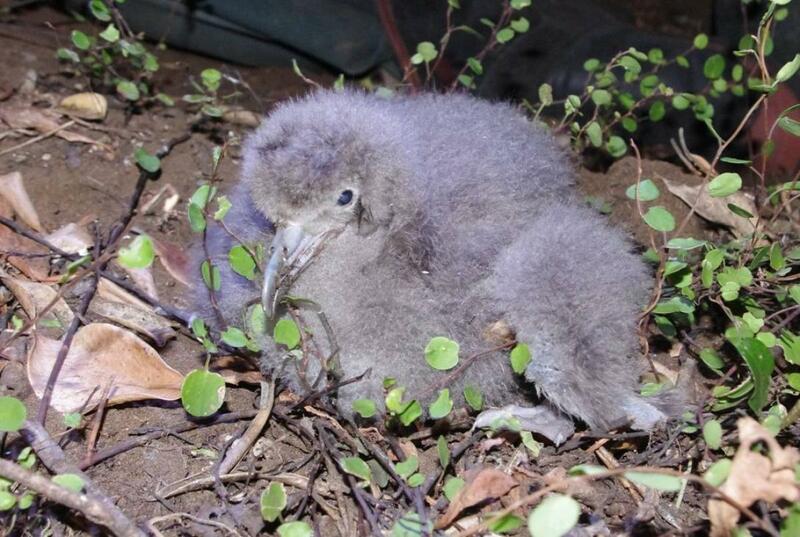 Declines have also taken place on Lord Howe Island, and so the species is now considered threatened. 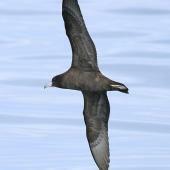 Flesh-footed shearwaters are largely free of land-based threats in New Zealand. All of the breeding sites except one are now cleared of introduced predators or have active pest control happening. However, at sea, the situation is not as rosy. 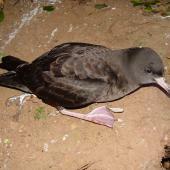 Flesh-footed shearwaters are regularly caught as bycatch in several commercial fisheries. 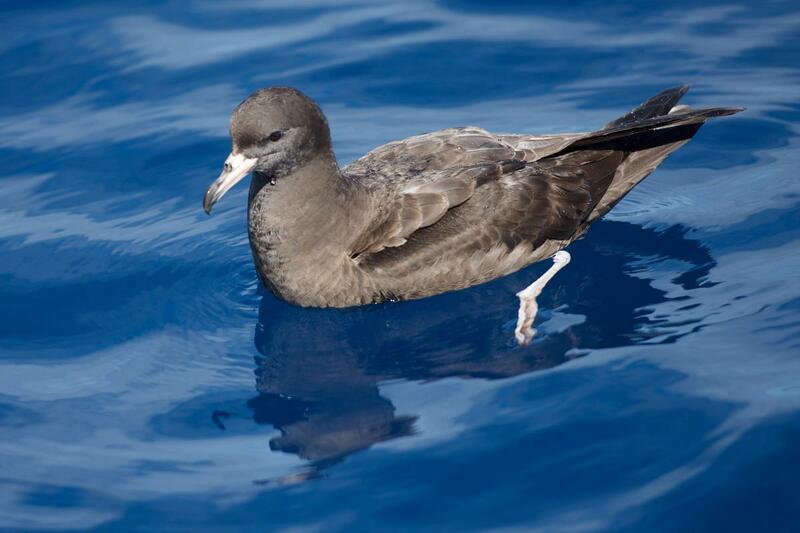 They are also frequently caught by recreational fishers; although most such birds are released with no or minor injuries, there is disturbing evidence that many flesh-footed shearwaters are severely injured or killed by fishers hitting them to keep them away from fishing baits. 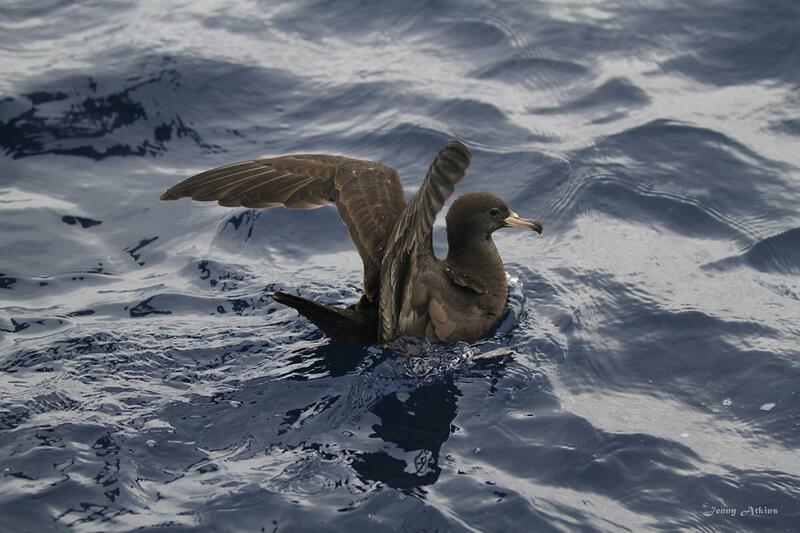 Flesh-footed shearwaters were vulnerable in the 2011 Rena oil spill and are at risk in future oil spills. 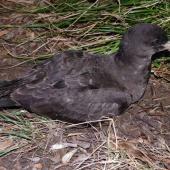 The Lord Howe Island shearwater population has encountered problems with plastics being ingested by the birds and this same threat may also exist in the New Zealand populations. 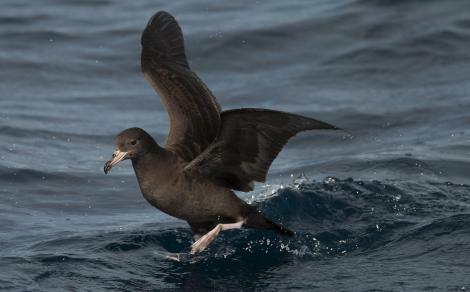 Flesh-footed shearwaters also feed close inshore in eastern Japan and some birds may have been exposed to land-based pollutants and raised levels of radioactivity in the ocean after the 2011 tsunami and Fukushima nuclear reactor plant explosions. 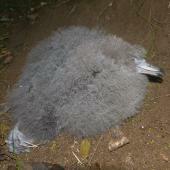 The conservation status of this species was changed from declining to nationally vulnerable in 2013. 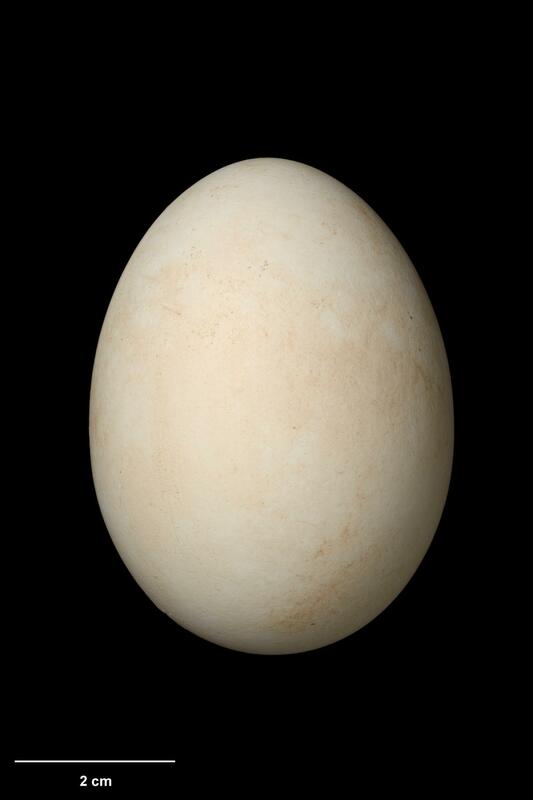 Flesh-footed shearwaters breed from September to May with the single large (69 x 46 mm) white egg laid from early to mid-December and hatching in late January or early February. Chicks depart in May. 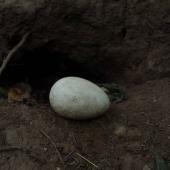 The egg is laid in a lightly-lined nest at the back of burrows (1-4 m long). 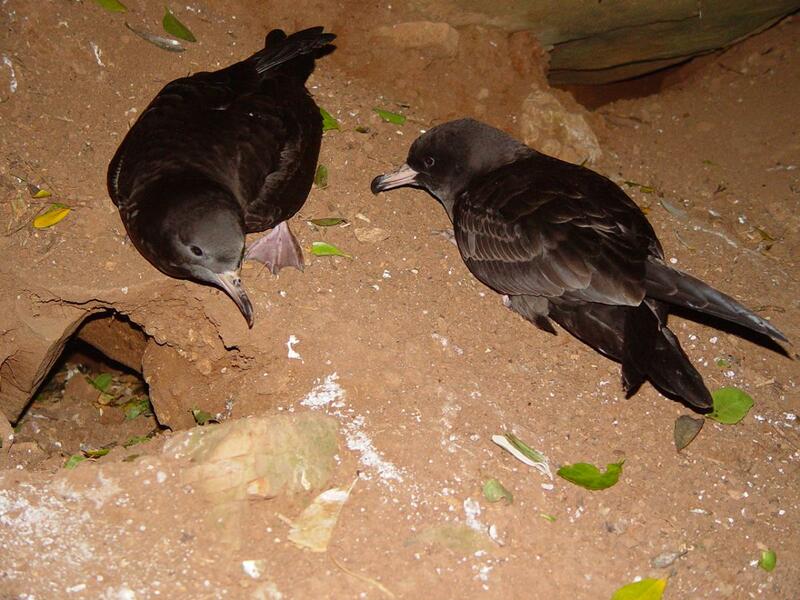 Flesh-footed shearwaters can be sensitive to human disturbance and sometimes temporarily desert nests by day after handling, although the birds normally return to the nest within a day or two. 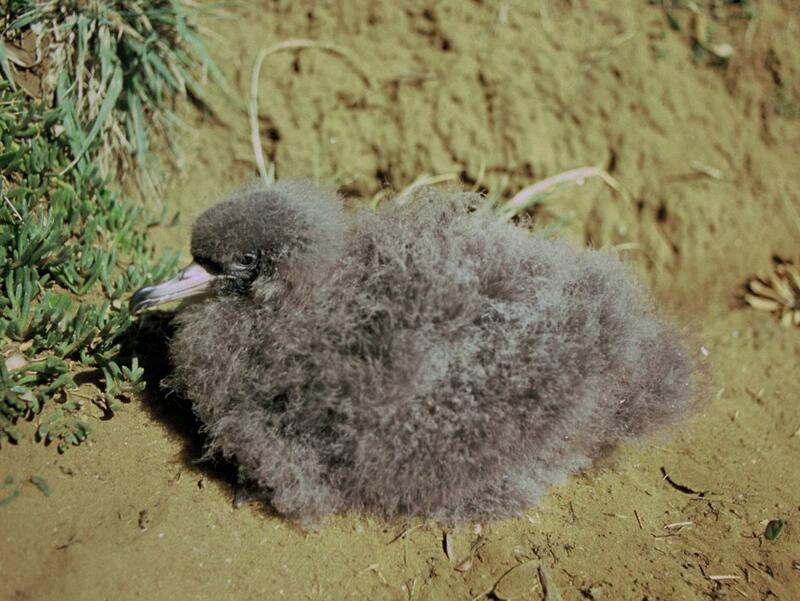 Egg-chilling resistance in this species (a trait common to other petrels and shearwaters) allows the egg to continue developing with little impact on breeding success. 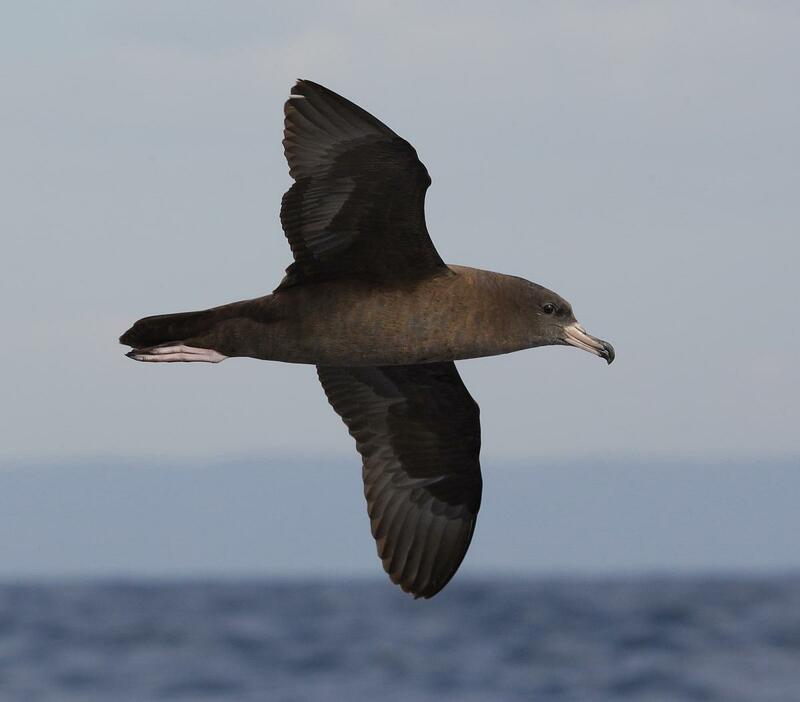 Flesh-footed shearwater breeding success is affected by oceanic conditions, with good years dependent on ocean currents bringing lots of small fish to seas near the colonies. 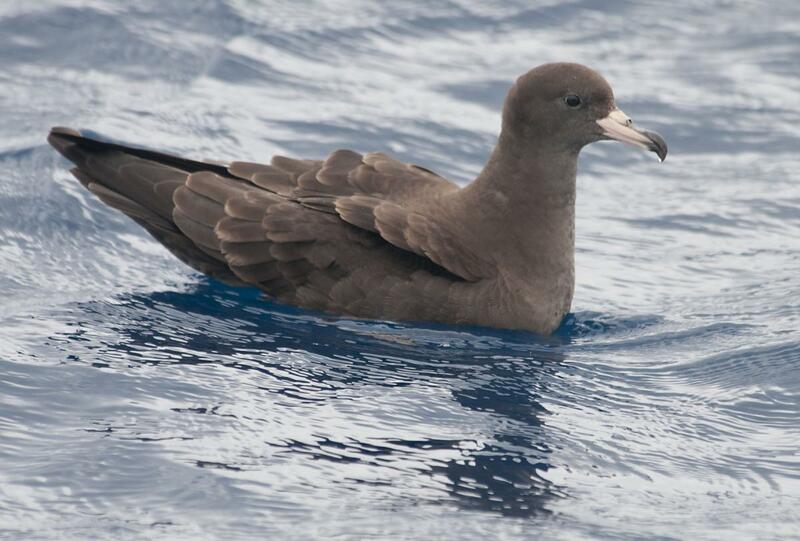 Immature flesh-footed shearwaters start to return to colonies as 4 year-olds and first start breeding at 5-6 years of age. 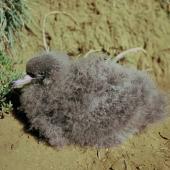 Flesh-footed shearwaters are nocturnally active at breeding grounds. 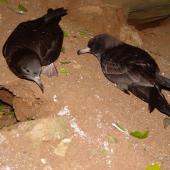 The first birds start flying over the islands soon after sunset and birds can come ashore throughout the night. Prospecting birds are very noisy on the surface at night, calling from burrow entrances and in flight over the colony. The birds are especially noisy in the period just before dawn and on large colonies it is nearly impossible for people to sleep through the dawn exodus period. The calls resemble those of cats having a huge fight. 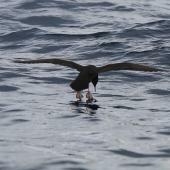 At sea, the birds range widely away from the breeding colonies, foraging over the continental shelf. 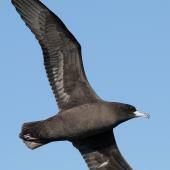 They mainly forage around the North Island, but also regularly north and west towards Norfolk and Lord Howe Islands. 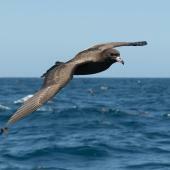 They are often seen from ships and boats, and will follow boats hoping for fish scraps or offal to be discharged. 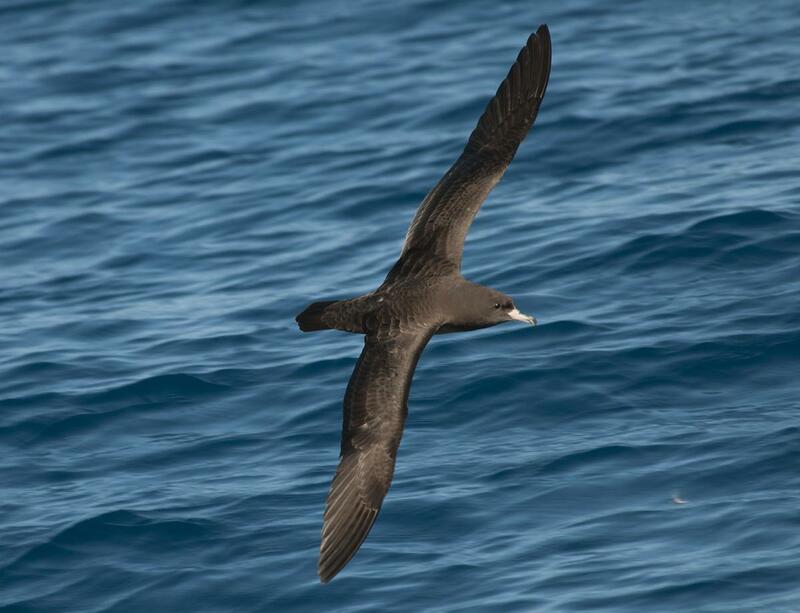 Flesh-footed shearwaters are trans-equatorial migrants, flying north directly after breeding via the top of the Tasman Sea or past Fiji and Tonga before heading north-west at the equator to reach the seas off Japan. 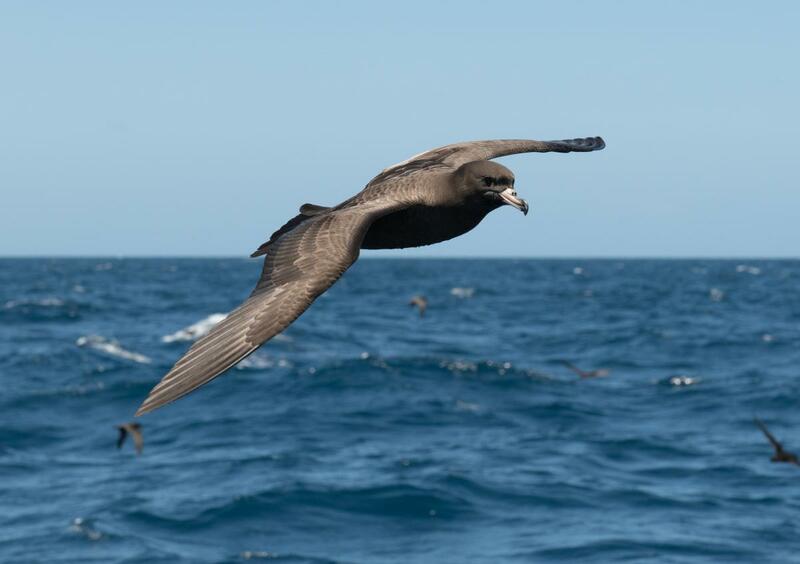 They return by heading into the central North Pacific and then south past Hawaii and down into the north Tasman Sea or past Tonga and the Kermadec Islands. 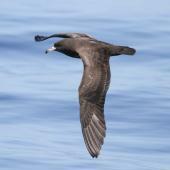 Flesh-footed shearwaters specialise on small fish caught by shallow dives into shoals, or occasional deeper dives reaching 30 m in depth. They sometimes eat small squid. Chicks are fed 80-90 g meals every 2-3 days on average. 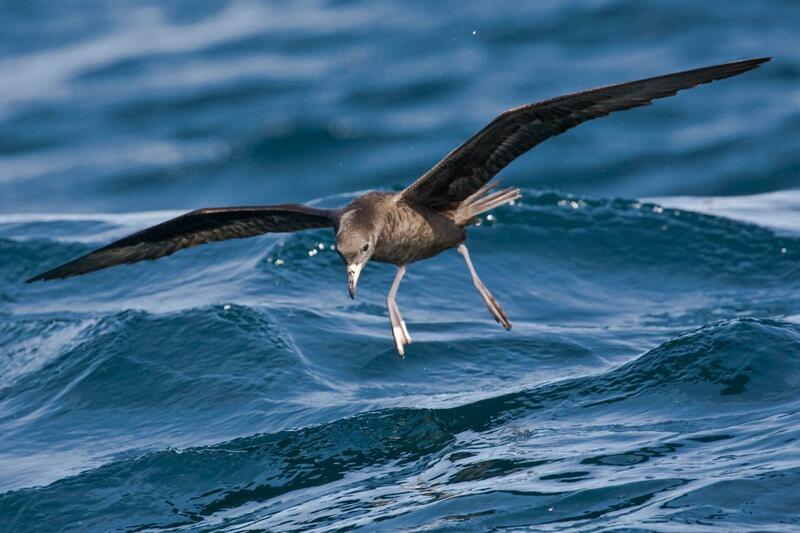 Activity sensors applied to the shearwaters legs suggest most feeding occurs during the hours of daylight. Baker, G.B. ; Wise, B.S. 2005. 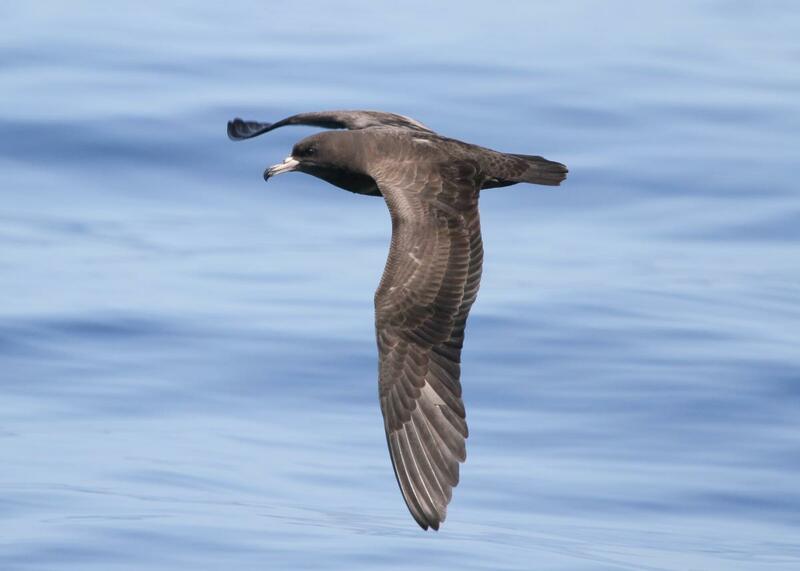 The impact of pelagic longline fishing on the flesh-footed shearwater Puffinus carneipes in eastern Australia. Biological Conservation 126: 306–316. Priddel, D.; Carlile, N.; Fullagar, P.; Hutton, I.; O’Neill, L. 2006. 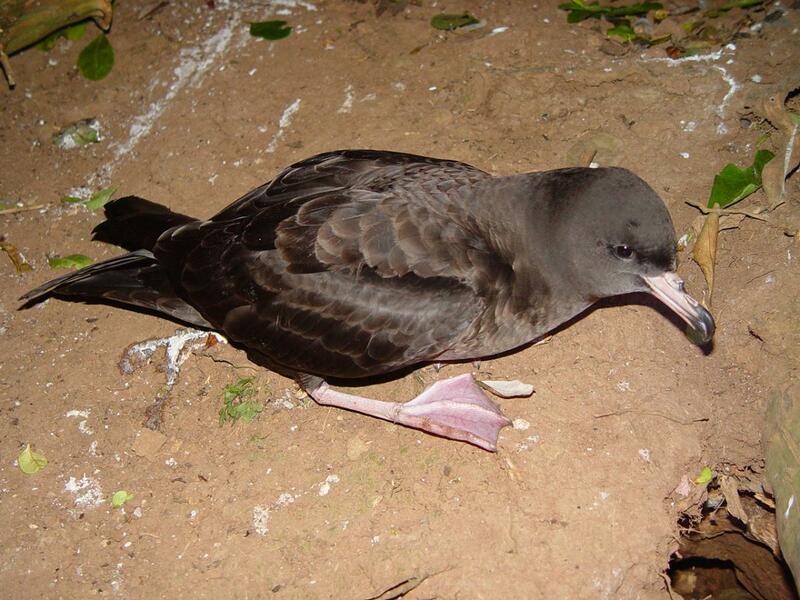 Decline in the distribution and abundance of flesh-footed shearwaters (Puffinus carneipes) on Lord Howe Island, Australia. Biological Conservation 128: 412-424. Rayner, M.J.; Taylor, G.A. ; Thompson, D.R. ; Torres, L.G. ; Sagar, P.M.; Shaffer, S.A. 2011. 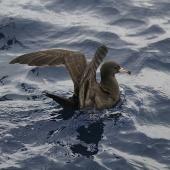 Migration and diving activity in three non-breeding flesh-footed shearwaters Puffinus carneipes. Journal of Avian Biology 42: 266-270. Thalmann, S.J. ; Lea, M-A. ; Hindell, M.; Priddel, D.; Carlile, N. 2010. 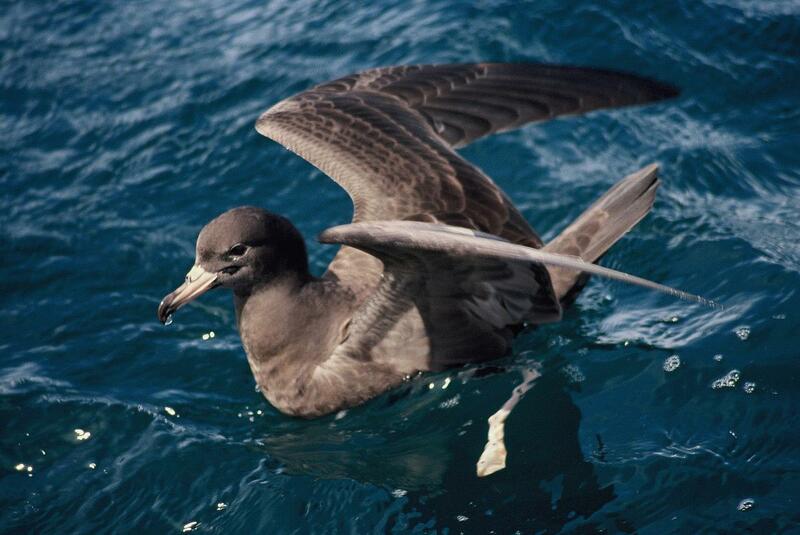 Provisioning in flesh-footed shearwaters (Puffinus carneipes): plastic foraging behavior and the implications for increased fishery interactions. Auk 127: 140-150. Well drained site in peaty soil, line with straw. 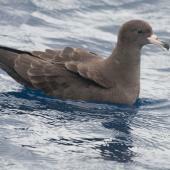 A medium-large uniformly dark brown shearwater with long relatively broad wings, a long pointed tail in flight, a pink-white bill with sharply hooked dark tip, and white-flesh coloured legs and feet that sometimes show pinkish webbing when landing on water.